A new book arrived in the mail from a publicist company. I had been looking forward to it. 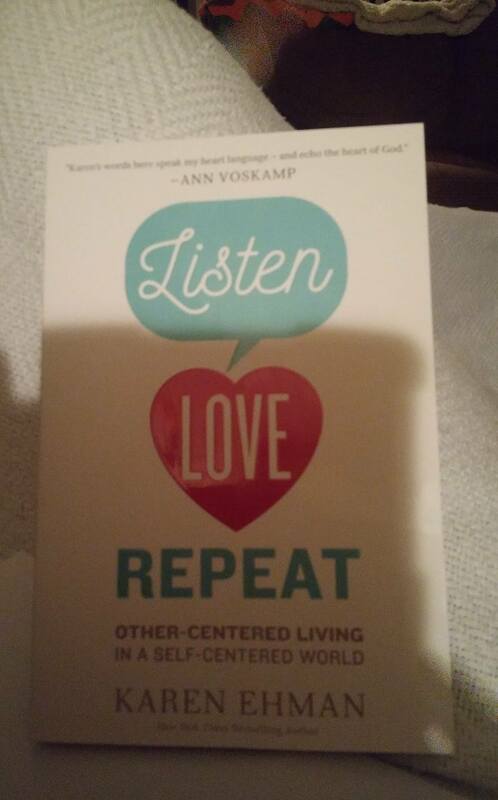 Listen Love Repeat: Other-Centered Living in a Self-Centered World by Karen Ehman. Part way through chapter one I am both ecstatic and defensive. How do we really listen online and serve in this other world? Sure, I’m only a bit into this book. The book may point out what I am going to point out now: Those pictures of ourselves, what we eat, what we’re doing, our schedule, and our relationships are bridges to conversation, especially with others who don’t believe in Isa. In our face-to-face world, we are constantly talking about this: our books, our life, what we’re eating, what we’re quilting, etc. Online community is the same way. However, we can get self-absorbed just as we can offline. Technology is just the mirror reflecting how we are in private. So how do we do other-centered living in our new culture since the online world is here to stay and constantly evolving? Let them know you are praying for them in private message, text, or comment when you see a status online that is a cry for help, a prayer request, or someone struggling with something. Silently lurking online and praying for them is like someone asking you a question on the phone and you nod in answer. They can’t see that nod. If you want to build relationships with people online and be other-centered, let them know you are praying for them. It shows you care. Live Out Loud. If you spend anytime in the Bible, you know that we aren’t to live in a bubble, ever fearful of letting people into our social media. On the other hand, we should still be discerning. There are real dangers online especially for teenagers. Let your social media reflect who you are in private. Let people see how you live to illustrate what you believe. Go ahead and post what you eat, about your relationships, your favorite books or movies, etc. I would suggest every other status be a question to ask of others on your social media, like what are you having for dinner? If we didn’t talk about our favorite books, books like this one would not sell. Our messages in ministry would not circulate. Show, and sometimes tell, how you are living out your faith. My final review will be posted on another website.